Congratulations on the arrival of your new baby! Our Catholic Community joins you in thanking God for the gift of new life. As you are seeking the baptism of your child in the Roman Catholic Church, the following guidelines are presented to help you embark upon this journey of faith with Christ and his Church. Through Baptism, God enables us to participate in his life in Jesus Christ and makes us his children. It is through this sacrament that we receive the Holy Spirit and become members of the People of God, of the Body of Christ, which is the Church. Baptism becomes our commitment to grow in this new life and to strive to acquire spiritual maturity. By baptism, God purifies us from sin. Baptism is the sacrament of faith which has the Risen Christ as its source, and it is the offer of salvation for all people. Intimately linked to Confirmation and to Eucharist, Baptism is, with these two sacraments, Christian Initiation. The child is baptized in the faith of his/her parents, of his/her godparents and of the Church. Parents are responsible for bringing their child to the Sacrament of Baptism as soon after birth as possible. Except in case of necessity, the church is the usual place of baptism. and that there is reasonable hope that the child will be brought up in the Catholic Faith. GODPARENTS: A person may only have one or two godparents (also called sponsors); if two are chosen, they must be male and female. and be neither the father nor the mother of the child. A baptized person who belongs to another Christian community may be admitted only as a “Christian witness” (not a godparent) provided that there is at least one Roman Catholic godparent who fulfills the above criteria. A non-baptized person cannot be a witness. Contact your parish office and express your desire to have your child baptized. Introduce yourself to the parish priest if you do not already know him personally. Open yourself to the invitation to actively join the faith community of your parish. If you are not registered parishioners, please consider becoming involved in the prayer and celebration of the Sunday Eucharistic community. 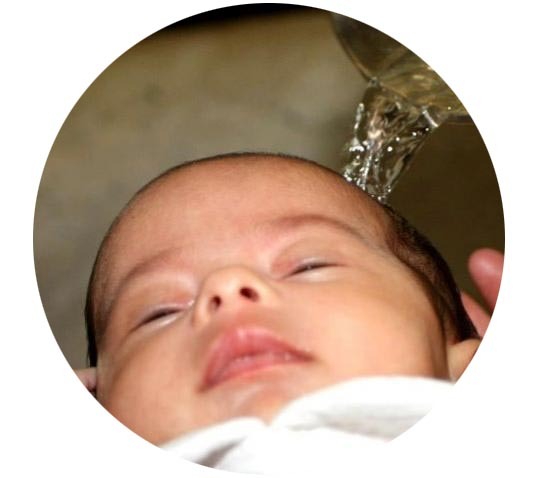 While baptismal preparation varies from parish to parish, you will be invited to participate in some manner of faith formation prior to the baptism of your child. This may take the form of a meeting(s) with the pastor, pastoral assistant, or participation in a baptismal preparation session for parents. It is extremely important to take your faith-life seriously because, before God, you have taken on an awesome responsibility for the salvation of another—your own child! Your commitment and openness to baptismal preparation will help develop the faith-life of your child as he/she matures. Are you living in a parish other than the one in which you wish to have your child baptized? You are required to take one of the listed Baptismal Preparation sessions. You will then receive a testimonial letter from your Parish Priest to have your child baptized in another parish. This requirement respects the reality that pastors normally have sacramental jurisdiction only over their own parishioners. Therefore, when one seeks a sacrament outside of one’s parish, the proper pastor’s permission is necessary. Furthermore, the invitation to connect with one’s own proper parish first is founded on the hope that the faith-life of the family and of the one(s) to be baptized will be lived in community and not in isolation. Your marital status will be clarified during the baptismal preparation process. Baptism is not denied if the parents are unmarried or not married in the Roman Catholic Church. However, there may be reason to postpone Baptism if parents are not practicing the Faith, or have no intention of living a Catholic life in harmony with the Gospel. If your status is not in harmony with the Roman Catholic understanding of sacramental marriage, please inquire as to how we may help you enter into proper sacramental marriage or, if need be, seek a declaration of nullity by the Church. All of the above information applies to INFANT Baptism only. If you have a child to be baptized who has reached catechetical age/the age of reason (Grade 2 or 7 years), you and they will receive different preparation. Having sufficient understanding, the preparation will now be for the full complement of the Sacraments of Initiation, ie. baptism, confirmation, and Eucharist. May God richly bless and guide you in your journey of faith! Easter Vigil Mass 8:45 p.m.